AutoStar #497 with Dead Flash ROM-- Recovery Possible? Upgrade Autostar 495 to 497? > the Autostar and any tips on how to gain ease of use from it. You've got to get out and play with it. Start in the early evening, late afternoon when it is still light and you can see what you are doing. I found the Autostar to be very easy to use even without reading the manual. You've got to answer the initialization questions correctly: location, date, time, daylight savings, etc. correctly or everything you do afterwards will be fruitless. The scope has to be in the home position and level. The Autostar alignment procedure doesn't require you know every star in the sky. If you pick the easy align with the two star option for the most accurate alignment, the Autostar programming logic will select two stars that are in the database for your time and location that will provide an accurate Al/Atz alignment. After you select the first star, the scope will slew very near the star you have selected from the Autostar choice. You should be able to tell which star it is even if you don't know it by name because it will be the brightest star in that area. If you're not sure, having a star atlas to reference helps. The star will not be centered in the finder scope, you'll need to use the Autostar left, right , up, arrows to center it. Then look in the eye piece for the scope and do the same thing. When you have it centered to your satisfaction hit enter and that location for that star is stored in the Autostar memory. The Autostar will now select another star for the scope to go to and the scope will slew to it. You repeat the procedure. Once you have entered the second star, if the Autostar alignment was successful, it will beep and tell you so. The go to function of auto align is now complete and you can slew to any object in the Autostar database and when you look in the eye piece it should be there and remain there as the clock gears continue to track the object. One reason I recommended you start when there is light, is that you have got to do a couple of things to insure success of this procedure. First, you're view finder has to be aligned accurately. You need to set up where you can see a distant object in the view finder, with the cross hairs on it, and then it must be centered in the eye piece of your scope. There are adjustment screws on the finder eyepiece holder for you to center your object. If you don't do this, or try and do it in the dark, you're going to have a miserable and frustrating outing with your scope. Second, after you have the finder scope sighted in, use that object that you used, I like using the insulator on a far telephone pole, to train the gears. The Autostar has a procedure to determine how much slop, backlash, the clock gear mechanism has in it. Autostar will direct you to center the scope on an object, then the Autostar will move the scope to the left/right and it will you ask you to recenter the object and hit enter, then it will move the scope up/down and have you recenter the object. When it is finished, it has calibrated how much backlash is in the gear mechanism. I believe the book recommends you do this procedure at least every three months. As for the user friendliness of the Autostar, it is a rather subjective term. I think Meade's Autostar GoTo function has revolutionized the industry. While some feel that the best way to learn the sky is with binoculars and a star chart, I could never get into that. The Autostar allowed me to start learning the night sky and know what I was looking at because the Autostar display told me what it was. It confirmed and reinforced my learning. I have had a few frustrating nights when, I didn't take the time to get an accurate alignment, or I entered the wrong date or time and the stars where not in the eyepiece, or didn't track worth a hoot. These were because I rushed my set up and paid for it in the long run. Read the manual and patience is the must valuable skill in the hobby. > with my hand controller. Most likely not a hardware problem. > the "blank" spaces in the Named Stars menu. Since you recently downloaded, I must assume you're now running v3.0d. (the number shows at boot-time) What you are "missing" from your list are the 70-odd alignment stars. I have NOT seen this condition on my Autostar II, nor have i seen this complaint posted on the LX200GPS group. > where "Rigel" would appear Beta Orion. What is going on? > have deleted the names of the stars. Yes, it could have overwritten a piece of memory it needed. Question: when you are -aligning-, does it show the star names? (b) reload the firmware, but (this time) do NOT add Tours, etc. Just leave them as they are. Just transfer the firmware. (c) If (b) doesn't fix it, Fire up the Updater, but this time -only- choose Garbage Collect (it's under Tools or Options). (d) if (c) didn't fix it, then (after the garbage collect, and it may well have been automatic garbage collection which broke it in the first place) choose Erase User Banks. After that step completes, reload the firmware (to re-establish the Named Star list), and then load a reasonable number of Tours, etc. (don't overstuff it). Subject: AutoStar #497 with Dead Flash ROM-- Recovery Possible? First, be sure to use the left-side serial connector on the scope. (the one nearest the HBX cable socket). Download the -newest- ASU from Meade's site... the one on the DSI CD is now 4 revs out-of-date. Firmware v4.x requires it. If the ASU still cannot talk to the scope, try StarPAtch (a non-Meade updater) from The download is free. It's -much- more robust about talking to the Autostar via Windows. Make sure you do not have something that normally uses that com port on your PC. Mine was a Palm Pilot Hot Synch. After I uninstalled it the update went fine. I followed Richard Seymour's advice and the scope is now up and running. I also updated my Window XP software because AU2 had errored out with a Windows library error. I'm bundling up and going out to the observatory now because its a clearer night than we've had here in Bozeman Montana in nearly a week. I've had my 10" LX200 GPS for about six weeks. In that time I have had an absolute blast - until last night. The telescope came installed with AutoStar II Version 1.0g that had been working quite well, however, I noticed that there was an upgrade to Version 1.2a on the Meade web site that offered some enhancement and bug fixes that I thought that I could benefit from. I downloaded Version 1.2a and the AutoStar Update Client Application for Windows, Version 3.50. I read the instructions in the archive and copied the BuildLX12a.rom file to the Ephemerides directory under the ASU installation. I attached the Meade serial cable from my laptop to the RS232 port immediately to the right of the HBX port on the telescope. I started ASU, read the online help, then clicked the "Upgrade AutoStar Software Now" button, once I was satisfied that I had done everything correctly. In the footer of ASU application there was a percent display that gave an indication of how far the download had progressed. The HBX displayed a message that said "do not power off" or words to that effect. After 10-20 minutes? not sure how long exactly, the hand box was restarted and it displayed "Meade Version 1.2a" (not exact but you get the picture) then I was prompted for my location state, which I entered. I powered down then I took the telescope outside an placed it on its tripod (no wedge) then turned the telescope on. After a GPS lock was obtained we accepted its offer of setting our location again. We made sure that the Alt and Az locks were engaged then proceeded to the Setup->Align menu and started the auto align procedure. That is where the problems started. The first thing that we noticed is that in the acquisition of North, the alignment procedure seems point the OTA skywards, probably 60 degrees of declination, this was clearly different to what happened in the v1.0g firmware which kept the OTA more or less horizontal. We both looked at each other and muttered that it must be something to do with the new software. Once all the other alignments had completed the AutoStar II announced that It would like to slew to the first star, Arcturus. I pressed enter and to our horror the OTA was driven vertically through 90 degrees and into the end stop to the sound of straining motors. We quickly powered the scope off then looked at each other. After some deliberation, we tried again and yes, you guessed it, exactly the same thing happened again. I will try to help you visualize what happened. Say the OTA was pointing due south and the target was due north, Rather than swing base through 180 degrees horizontally and adjust the OTA's declination, it seems as though the firmware wants point north solely by adjusting the declination of the OTA with the end result of the tube smacking into its end stop. It was a good thing that I did not have the Micro-focuser, diagonal, or eyepieces attached, otherwise a lot of damage could have occurred. We tried a third time with the same result. What have I done wrong? Is there something I need to do once new AutoStar II software is installed? Do I have to realign, retrain, calibrate, the telescope? I am not too sure what to do to correct this problem. If I could fall back v1.0g, which was working, I would in an instant - I cannot find anywhere to download that version, though. As a last ditch thing, we reset to factory defaults from the setup menu and tried a fourth time with the same results and gave up quite disappointed. After loading the 1.2a version the first thing you should have done was a "reset", then a "cal. sensors". What has happened is that it has true north off considerably from what it is. The "cal. sensors" will readjust it. I had the same problem with my 10" trying to run the vertical stops (agree it is a horrible feeling). I go into this mode my prematurely hitting the enter key before I centered the north star in "cal. sensors" mode. So my cal got messed up. I had to do "cal. sensors" twice before getting it back to normal. Next time you power up "mode" out of the normal align sequence and do a "cal. sensors". Then go to auto align, things should work fine. Don't worry, I don't believe any harm has been done. Thanks very much for your input. You all provided me with enough information to solve the puzzle. Special thanks goes to Paul Tanaka who gave me the key to gaining back control of the telescope. I had to reprogram the Scope with the ASU. Paul advised me to make sure that the "Erase User Data" check box was checked. Without doing this the telescope proceeds to do the same odd things immediately after cal sensors. The telescope should remember your PEC training across the v1.7 -> v2.0 upgrade (just do NOT select "Erase User Banks" in the Updater. That -would- destroy the PEC data.). In fact, before you update, start the Updater (not the SMT installer) and choose the Tools menu. In there, select Edit User Data. On -that- screen, tick the [x] Pec Tables choice, then click the [Save] button. That will store your PEC tables on your PC, and you can therefore restore them IF the update process destroys them. V2.0i does NOT correct the no-DEC-anti-backlash-in-Polar problem. > glitches, though it took its time - nearly an hour. > doesn't prompt for date or time and goes straight to Align Automatic. That's all normal behavior. You evidently moved up from an LX200GPS version -earlier- than 1.6b, when that change in start-up happened. If you turn on PEC, then the Smart Drive will again spend a moment moving during the initialization phase. But if you don't use PEC, it means it won't skew your carefully-aimed north pointing. It will take its GPS Fix when it has to... after doing the dance for the AutoAlignment. This lets the GPS receiver "listen" during that dance, which leads to a faster Fix when it finally listens for one. The previous date -will- be remembered, once you've entered one. And, during the alignment, it will start the Astronomical drive. It will also start it if you simply GoTo any Astro target, even if you don't align. Editor's Note: also see discussion on updating to v1.2a for additional advice. Since upgrading the firmware in an Autostar telescope is almost casual (unlike the classic's ROM replacement) having "many" releases isn't too much of an issue. Subject: Upgrade Autostar 495 to 497? 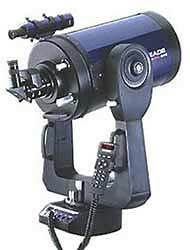 Is it possible to upgrade the Autostar 495 of the Meade DS70? Autostar 495s are for all intents and purposes, 497 Autostars. Same 1 Mb of memory, although the 495 tells you it only has half of that. I have updated many to the new firmware. I have 2 "former" 495s that are now 497s at the 2.6ed version. >track= it=20 (assuming it's a star)? > How about tracking planets, moon..etc? If you mean will tracking continue once the slew has finished, then the answer is Yes. At whatever tracking frequency was previously used. If you mean "can I interrogate the controller for RA/Dec while it's slewing" then the answer is also Yes. The slew commands you mentioned above operate exactly as if you did it from the hand controller. > if=I'm=20 communicating with Autostar via the RS232 bus? Sadly, no. Meade had a very "open" feature set with the LX200 Classic -- virtually anything you could do with the hand controller was doable via the serial interface -- but this has, unfortunately, not carried over to the Autostar. While writing my own programs <http://www.adpartnership.net/ScopeDriver/> and researching them, there is no way to directly access the Autostar library via serial control. The *commands* are still there, they just don't return anything meaningful. For example, a "LI" command will always return information about the Andromeda Galaxy when you query an Autostar. > it (assuming it's a star)? How about tracking planets, moon...etc? Once you set the coordinates and slew to the object, the Autostar will track the star or planet at the sidereal rate. I'm not sure whether it auto-detects the lunar tracking rate when you slew to the Moon via coordinates, but I do know that you cannot set the tracking rate manually via serial control. <http://www.meade.com/support/LX200CommandSet.pdf>. Some details about programming are in the back of the manual for the classic. Don't know if it's in the GPS manuals. <http://www.meade.com/manuals>. The first link will include some commands for the Autostar/GPS scopes not included in the classic manual. > Is the list on Meade's website not current? No...there is at least one 'undocumented' command on the latter systems (":Mgs1234#"), which slews the scope at guide speed, in the selected direction (the 's' is replaced by 'n', 'w', or 'e' as required), for the specified number of mSec (in this case 1234). I have never seen this on any of the Meade documentation, but this is used by their own Autostar based guide system, and allows the latter scopes to be accurately guided (they lack the command normally used to do this on the older scopes). I suspect it was added after complaints about the removal of the old command, but has not made it into the protocol specification. For you electrical and real low level SW types, here's info applicable to all Meade Autostars that use the Motorola 68HC11E1 micro-controller. The processor has the capability to be bootstrapped into some special modes. I had to dig in because of corrupt EEPROM and HC11 control register setting caused by the lack of a low voltage reset circuit in the low end AS494 which gave me a dead Autostar. In the special bootstrap modes you can control the micro via the serial port and SW from Motorola called PCBug11. It gave me enough control that I was able to bring it back by manually setting values in the EEPROM and control register bank. For the higher level Autostars that have RS232 capability you do not have to add your own ttl-rs232 converters, just plug the cable in to the handbox or base (as the case may be) and 'bug' away after resetting with MODA/MODB pins on the micro grounded manually. A few months ago there were some observations flying around the Yahoo eGroup about the calculation accuracy of the II's when applied to the inner planets and fast moving asteroids. I put together this small webpage that compared the calculated position versus the positions provided by the classic and a few PC based programs. The results were not exactly what had been expected. Just adding to the MAPUG-Astronomy.net info on the firmware used in the Autostars of GPS units. I do not know if subsequent firmware releases have addressed these issues. One thing I recommend is to try talking to the LX200GPS with a program like HyperTerminal, which is a standard part of Windows. If you like, I can send you some details on how to do a simple test with HyperTerminal. If you can talk to the scope this way, at least you know that your cabling etc. are OK. Seeing as how youve tried with multiple PCs, this may or may not help. Also, be absolutely sure that nothing on your PC is grabbing the COM port. I found on my new Dell that my FaxModem and my UPS were both grabbing the COM1, and I had to disable both to get ASU to communicate with the LX200. I purchased a 10" LX200GPS during the summer and could never get the telescope to communicate with my computer. I had Meade check out the RS232 ports, and they say the RS232 ports are okay, but I still can't use the Autostar Update Program (v.3.61). I have my com port set to 9600 bps, 8 data bits, parity none, 1stop bit, Flow control none. I am running Windows Me on my computer and I checked my RS232 cable and connector and they are also working properly. I tried several different computers and I also tried a USB Serial Port Adapter. All of the computers display the error message from the ASU software "could not find AutoStar" and then ASU searches all the com ports and does not find anything. I was wondering anyone out there can help me or has experienced a similar problem communicating with their LX200GPS using the Meade ASU software. If you have tried several computers and Meade says the RS232 port on the scope is OK the only things left are the program you're using OR the cable. I'd think the cable is the most suspect. > that I can no longer get them to connect to The_Sky software. By "put SMT on", did you also -upgrade- the firmware? If so, from what version to what version? Can the Meade Updater still usefully talk to the scopes? (try the [receive data] tab, it will pull the User Objects to your PC without attempting to -write- anything to the Autostar). Can -other- programs reach the scope? (Telescope/Protocol/Remote Handbox) but I not able to do it. on "Initializing" (while, after a few seconds, I should see the menu tree). Andreas, once you have started the Initialization or Update process, check at the very bottom left of the "Updater" dialog box, it should show you, in fairly small letters, the percentage complete for the various operations. It sounds to me like may be working OK. Autostar II Updater is a very slow process, sometimes takes me 30 minutes to update my firmware version. Another thing to do is check that your communications speed is as high as possible. I can run mine at 57,600 with no problems, but yours could be different. Andreas, if you do not see a series of periods (.) following the "Initializing" text, then you are not communicating with the Autostar. Also, it can take as long as 30 or 40 seconds after you see the sequential dots appear before the Autostar menus appear - be patient. Be certain you have identified the correct computer COM port. If you're not certain, use the Windows Device Manager and look in the Ports (COM & LPT) menu. You must have the correct serial data cable for use between the computer COM port and the RS232 RJ45 jack immediately to the right of the HBX port, i.e., not the jack further away. If you are able to use this serial cable assembly with other software applications successfully, then it's possible you are incorrectly using the Autostar Suites software. Note: I believe these are the default settings so they should not require significant changes. There is a Comm Port Test utility in this menu but it tends to misbehave sometimes. I wouldn't trust it. I have successfully used the Autostar Suites software using both serial and network connections with my LX200GPS. get a GPS lock or see any alignment stars. receiver) and have entered that info into the Telescope as my home location. time and date, then accept the slews that are done for the two alignment stars. but cannot, for the life of me, remember where.---end of quote. Manually center Vega (for example) after an Auto slew to it. Then press and hold Enter for about two seconds. When you let up it will ask, "Sync on Vega?". Short press Enter and it's sync'd. If it is in altaz, then level the base, point the telescope as close to north and level as possible, go through a two star alignment, press enter when asked to center a star (Do this with the aperture cap on!). Afterward slew to the sun. The tracking won't be perfect but close. And I never see the stars and I do this in the middle of the day. I just assume that the alignment is perfect and after it says press enter after centering I press enter immediately and never look the telescope. You can enter the Sun as an asteroid, (actually an asteroid in Earth's orbit, just 180 degrees out of phase). There is going to be a significant change in this very soon. Due to heightened security since 9/11, the US gov't has decided that satellite orbital elements provided by them can no longer be re-distributed by third parties. The defense dept. has set up a website for distribution of satellite data. See: <http://www.space-track.org/perl/login.pl>. For more detailed info, see: <http://www.celestrak.com/NORAD/elements/notice.asp>. _Anyone_ who wants access to this data in any way needs to apply at the Space-Track website for a user account and password. That includes amateur astronomers who use scopes or software with satellite tracking/plotting ability. Software that uses this data is currently being updated so that you can enter your Space-Track username and password, and it will automatically retrieve the needed data from Space-Track. I've heard that TheSky has already updated.